As I mentioned in my previous post about Work & War, I often find myself liking what the smaller brands are up to. In the wake of the previous post, I had a few emails asking me to mention some more of the small brands that might be of interest to my readers, so here goes. Not an exhaustive list and no doubt the second I post this I’ll think of half a dozen more that should be mentioned, so maybe a part 2 sometime later? By all means drop me a note if you have suggestions. Now, not all of these may apply to all companies that are small, but in general terms, they apply. The direct sales is an interesting model as well, as in addition to giving the customer a better deal, by cutting out the middleman and the middleman’s markup, the advantage in pricing can be shared by both brand and customer, thereby making it a more viable business model even with what can amount to small sales figures. Paladrin is in its second year now. Born and bred in and of London, it’s all about jackets and shirts. The brainchild of Tim, a young graphic designer, it’s a modern take on workwear with a focus on using British made fabrics such as moleskin, corduroy and cotton twill. 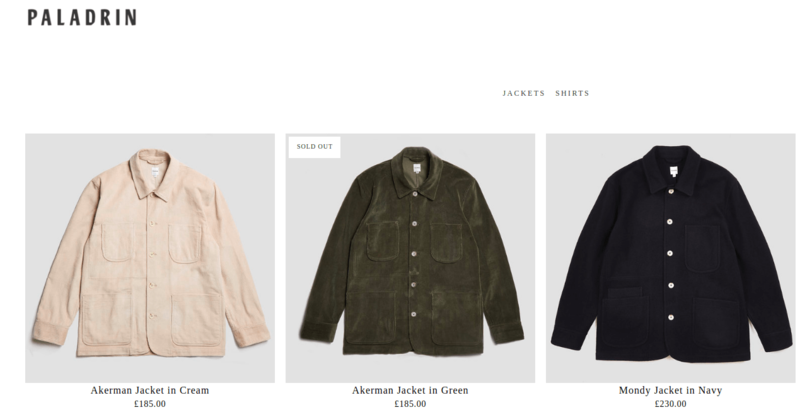 All the shirts and jackets are made in a factory in London, in limited numbers. The second season of garments was released a short while ago and I see a fair amount is already sold out. In my experience, well made and good value. Clearly, the reputation is growing! Check out the moleskin shirts. 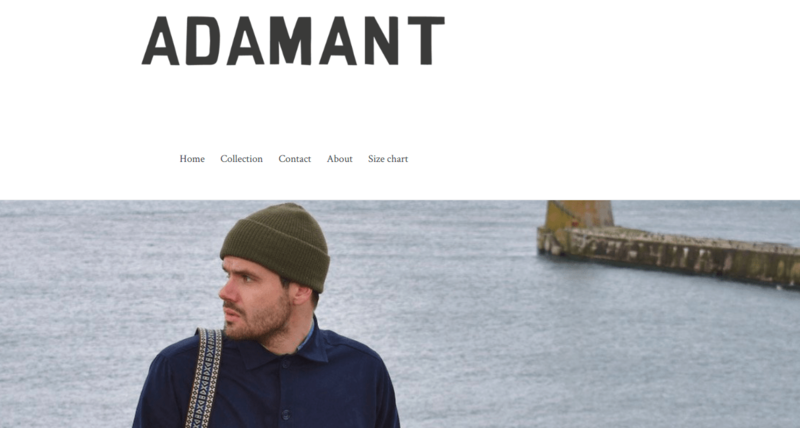 Adamant is another one-man company doing shirts, this time from their base in Aberdeen. Just a single style of shirt, the Broadford, available in two colours, and a limited edition season tee. The shirt is an inspired design, combining tweed and a heavy duty cotton twill, to create a rugged and distinctive shirt. The t-shirt celebrates the glory of the Scottish summer. The Broadford shirts are made in Lancashire. Rumour has it that there are new things in the works, so there is currently a discount on the remaining stock of Broadford shirts. In my experience, good value for money. Worth keeping an eye on! Agreste is, and yes, you saw it coming, a one-man company again. This time though they’re located in Valencia in Spain. Using local production facilities and their own designs, they are manufacturing an impressive range of denim, chinos and shirts. Given the climate of Valencia, these make good sense for those of us that are experiencing anything remotely like Summer at the moment. the range is expanding and I notice there are currently both pre-orders available and discounts on some existing stock. 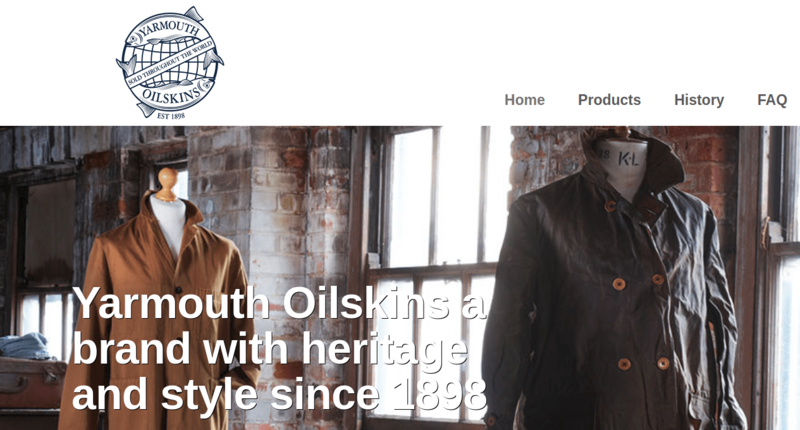 In my experience, well-made garments and good value. Check out the patterned shirts. Trickett is, indeed, another one-man company. The brainchild of Iain Trickett (Garmsman #12, read it here), the brand is eclectic, to say the least. While it’s not exactly a one-stop shop, the range and diversity of products Iain offers is unusual. I believe the primary product is socks, specially made by a family-run factory in Italy. From there it goes on to shirts, t-shirts, shorts, trousers, backpacks and so forth, and ends up in pie dishes. Which does tell you a lot about Iain and his dedication to Accrington, his hometown in Lancashire. And much of the products he has made are made locally, like the pie dishes, made in probably the last enamel dish factory in the UK. IN my experience, great value and top products. Do yourself a favour an get a pair of the khakis before they are gone. Yarmouth Oilskins are not a one-man company! They’ve actually got around 20 people in production, but qualify as a small brand through being a company almost no one has heard about. Which is strange, given that they’ve been in business since at least 1898. During this period the family-owned company has been huge, around 1200 employees, when they supplied the fishing industry with oilskins and sweaters, and not so huge, during the wars. After a period of dwindling business, they are now focusing on their archival history, going back to making archive pieces in the way they used to be made. This means engineers jackets, bus drivers jackets and shirts. Check out the Worker shirt for a nice, classic piece. Ebbelsen are currently a one trick pony, making a single product, the Mk2 Trekking jacket, in a range of 4 colours. There is strength in the single-mindedness though, as rather than spread the focus over a range, they have put everything into making the best possible outdoors jacket. I reviewed it a while back and liked it a lot, read the review here. Worth checking out if you need an all-weather, all-terrain type of jacket to cover pretty much any use. Thanks, Roland, hope you found something of interest. I wonder if you’ve come across Old Town? I first came across them in Country Living magazine many years ago. I think you’d like their style and philosophy. Lizzie beat me to it! They’re well worth following up; great trousers. Jackets also good, but regrettably the sizing doesn’t quite work for me. I fall just in the middle of two, but after biting the bullet and getting it altered, now have a winner. In my ongoing obsessional pursuit of a weatherproof smock like those from The Heroes of Telemark, I’ve just bought a Mick GT smock from Connection Knitwear and Clothing, a small brand based in Milan. I think their style is more geared to the 60s mod scene. Some very nice pieces made in Italy. great piece. all look solid operations. looking forward to Part Deux.